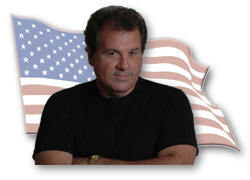 Joe Cantafio, a talented entertainer and successful business man, is one of those special Americans ... who could have easily been one of the Founding Fathers ... if he was alive during America's fight for independence ... as it is his nature to be proudly involved for the good of the USA ... beyond self interest. His love and pride of country is always evident ... and none more so in his tireless support of our troops and veterans, including their fallen and wounded comrades. He wonderfully represents what it means to be a ... Great American Patriot! Joe Cantafio, has even achieved his goal with the founding of the National Veterans Museum ... with a mission to honor the contribution and sacrifice of the more than 40 million men and women who served in the Armed Forces of the United States of America. The museum will educate visitors about the times our troops served and preserve the legacy of our veterans through state-of-the art, immersive displays, animatronics and an extensive collection of artifacts and archival documents. At the National Veterans Museum, military history will come alive and be presented in a manner that's relevant to a generation accustomed to absorbing information through various media. After the attacks of September 11th, Joe Cantafio tried to enlist into the military but was turned down because of his age. Joe then turned to his first love, music, and created a “one-man” show titled “Let Freedom Sing,” a tribute to the FDNY firefighters. The show caught the attention of the nation and Cantafio and FDNY firefighters toured the country during 2001 - 2002. During the month of February of 2004, Joe Cantafio assembled an “all-star” band which he named, The 101st Rock Division. Along with Cliff Russell, Cantafio and the band performed 9 shows in Iraq, including performances at Camp Victory (Baghdad), Camp Anaconda (Balad), Tillil Air Base, Camp Falcon (Baghdad), Martyrs Monument (Baghdad) and Baghdad International Airport. In addition, the group entertained American and coalition forces in Qatar, Bahrain, Kuwait, United Arab Emirates, and Djibouti, Africa. Upon his return from the Middle East, Cantafio and Vietnam Veteran friend, Robert Kolling founded USA Forgotten Heroes. Bob and Joe developed events and enlisted the service of other entertainers to perform for the thousands of wounded warriors who fill our Veteran Hospitals across the nation for several years until Joe Cantafio founded the National Veterans Museum. “The song was inspired by Ryan, his short life and his great service to our country, however, it is dedicated to all “brave warriors,” who have joined our great military and served selflessly, giving up all of their “tomorrows” so we can live in peace and freedom today. I wish all Americans could see what we saw in February of 2004. Our troops are doing an incredible job under less then comfortable conditions. Sure, we all see the key battles, the over-hyped scandals and the death toll on the nightly news, but why don't we see the new schools and buildings, the new roads, electric power plants and water and sewage systems and yes, even recreation areas that the US military personnel are building? 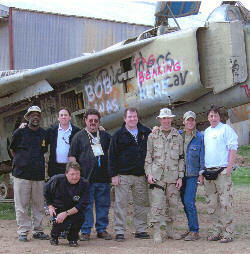 While entertaining in Iraq in 2004, I would ask our troops why are you here? The top two answers were; 1) ‘So my children won't have to deal with this …' and 2) ‘ …to rid the world of terrorists.' Some of the finest people I have met in my life, I have met on military bases. 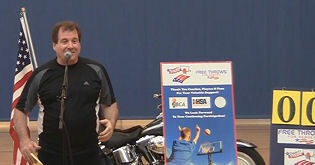 Joe Cantafio is also involved with Free Throws For Heroes ... shooting 100 free throws each June to raise money for a memorial fund in honor of several fallen heroes, including his cousin, USMC Ryan Cantafio. 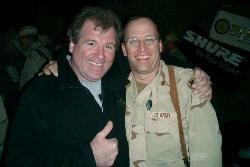 Joe with a solider after a show in Iraq. 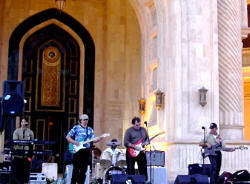 Joe and the guys perform on the steps of Saddam's Baghdad Palace, renamed Camp Victory - 2004. Joe Cantafio and Jade perform on Joe's “Let Freedom Sing Tour” at St. Zachary's Augustfest in 2002. (l to r) Vic Lubieniecki, Frank Capek, Joe, Chuck Acosta (drums) Joe Macicak and Steve Albue. 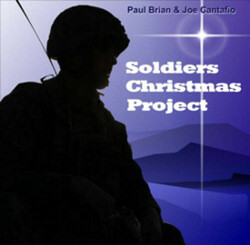 Joe Cantafio partnered with veteran Chicago broadcaster and voice actor Paul Brian in the Soldiers Christmas Project, a holiday celebration of the spoken word, music and song has been released for download by JP Music of Oak Brook, Illinois. The 11-cut CD includes poems honoring the service of our military, the traditional biblical Christmas Story from the Book of Matthew, O. Henry's “Gift of the Magi,” and other original works including what many have said will be the next big single for the season, “I Want a Kiss,” brought back to life after a quarter century of waiting to be released! “The timetable this recording project was on would have made any sane person walk away,” said Paul Brian. “The idea for it hit me when I was hospitalized with the flu last month. I called Joe and said, ‘I have an idea,' and from there we've been going at warp speed to today when we're proud to make these remarkable readings and recordings available to the public." Both performers designated the Wounded Warrior Project for contributions from the proceeds of the album. Joe Cantafio wrote Brave Warrior in memory of his cousin, Ryan (a Marine), who was KIA in Iraq in 2004.